Ok, so you may recall that I made a nice set of beaded socks for Sock Madness that were a bit too long in the foot for me. Well during Sock Madness there are specific rules per pattern to help ensure that at least everyone knits a standard requirement. For me, that meant my sock feet were too big. So technically they were finished, but then I needed to re-finish to make them wearable. 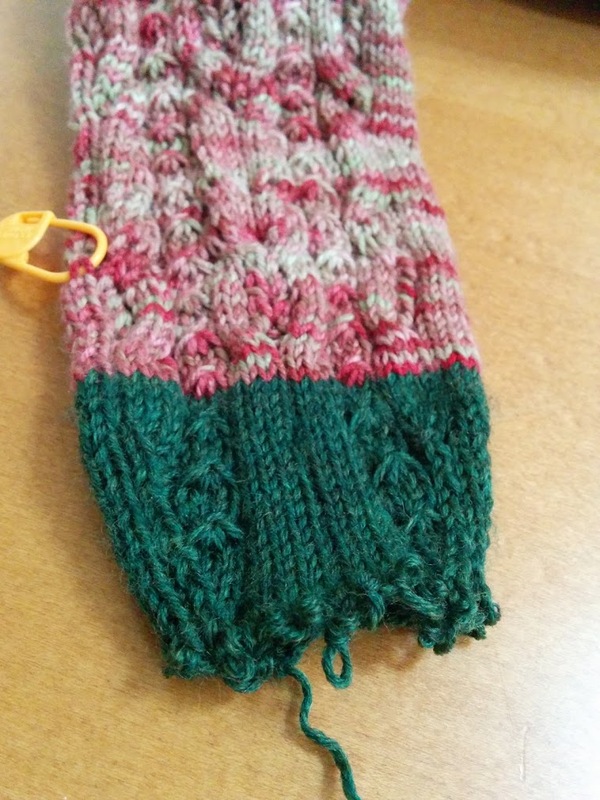 I did realize that my socks were going to be too long so I did put a stitch marker at more appropriate measured row for starting my toes and did not weave in my yarn tails, just tucked the toe yarn inside the sock. So the first step was to un-kitchener the toe. Here you can see my marker for the earlier toe transition point and I’ve unworked the kitchener stitches. Since I have quite a bit to frog back, I decided to just pull back like one would frog the entire item, but by keeping a handle on how fast and far I was pulling, be able to re-pick up my live stitches at or around the row I’d marked. 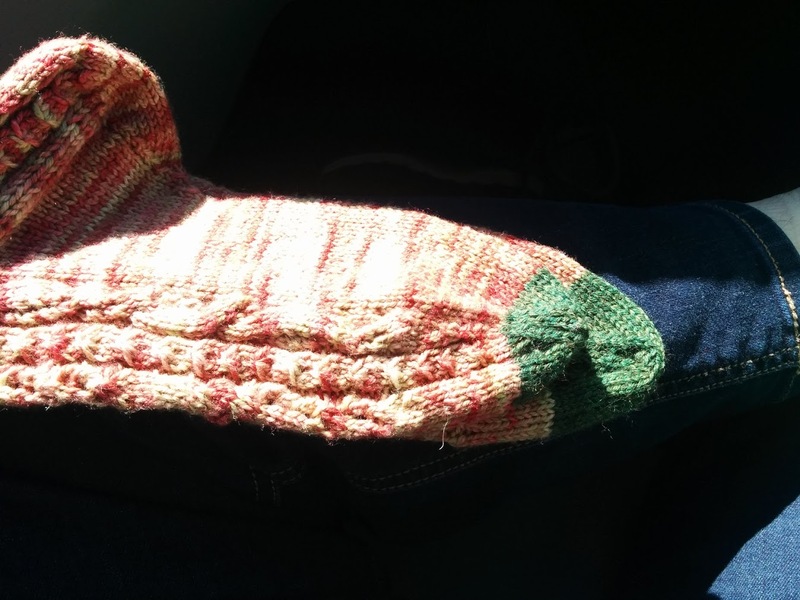 Here is one sock where I’ve pulled all the green yarn from the toe. I will continue to pull back to my marker. After you get to the row, pick up each stitch on your needles again. If you knit tightly, you may want to use a smaller needle to pick them up. Be careful not to miss any loops. Once you have your stitches picked up again, you just use your directions to re-knit them to the correct length. Here’s a photo of the first sock re-completed stacked on top of the other sock in the original finish so you can see the foot length difference. 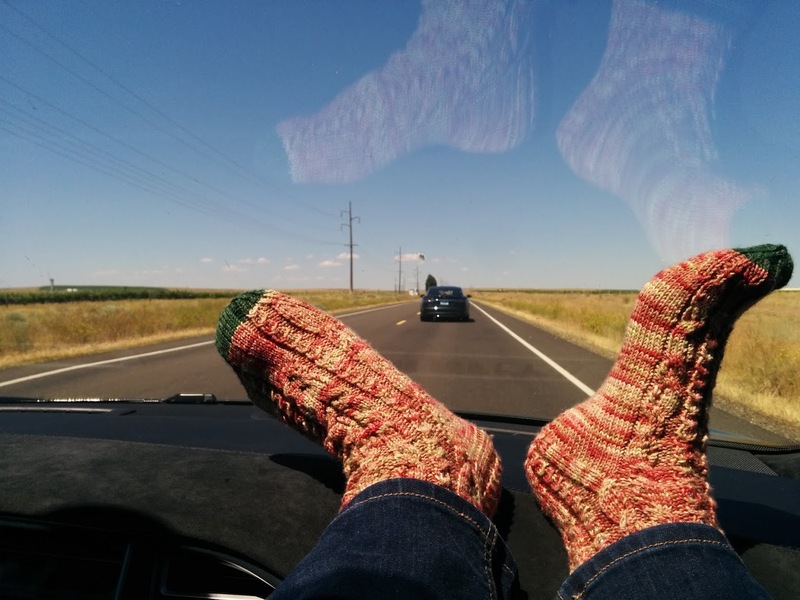 Sorry about the lighting… I was working on these while taking a drive to Oregon. After you have finished the first, then you work the second just the same. In semi-related news. 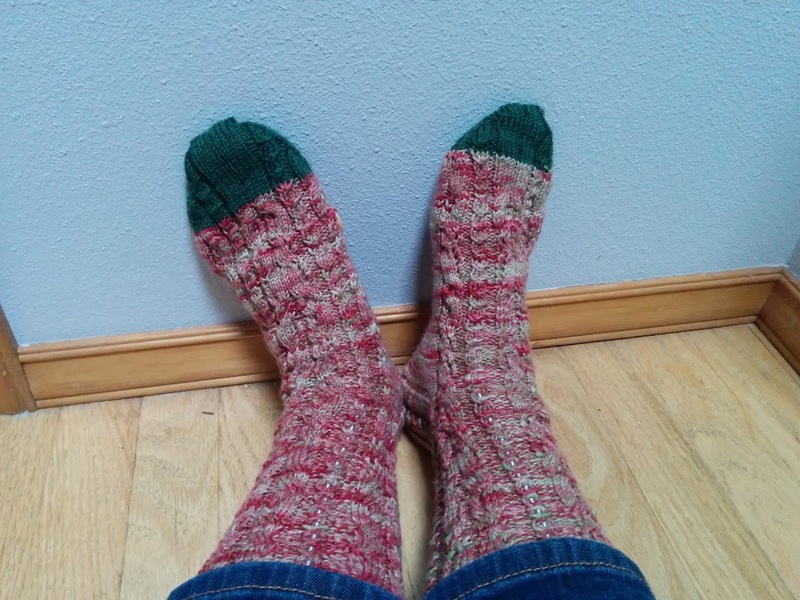 I also finished my second Woodruff Sock, which is my first colorwork sock. They are a bit roomy, but not too big I think if I were to knit them all over again I’d probably go down a needle size, but we shall see after the first real wear and block. Here’s some beauty shots.